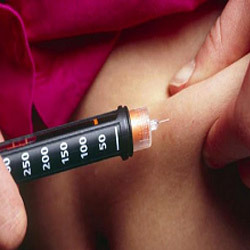 Insulin is a hormone, which keeps your blood sugar with in normal limits. Whenever we eat food it gets digested & gets converted in to glucose. Glucose thus formed gets absorbed and goes to blood, and from blood it is transported to cells with the help of Insulin. Major Complications e.g. Nephropathy, Neuropathy, Retinopathy etc. Back and Outer aspects of Arms. The most preferred site is "Abdomen"
Always check the Type of Insulin, Manufacturing and Expiry Date; and also Type of Syringe. Always learn to take Insulin yourself and never change the type and dose of Insulin. Always take Insulin Analogue 10-15 min, Regular Insulin ½ hour, NPH Insulin 1 hour before meals; and Insulin Glargine or Detemir after meals. Always store Insulin in door shelf of Refrigerator or in a Cool place. Always take some Insulin even during Fast. Always maintain a chart for Dose & Type of Insulin. Always inject Insulin at 90 degree in obese/normal and at 45-60 degree in lean patients. 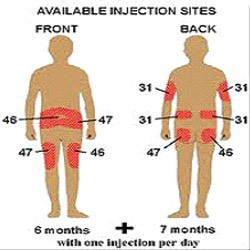 Always rotate the sites for Insulin injection and put a mark after every injection. Never inject in an area to be exercised. There is a common myth that Insulin is habit forming, it is wrong and totally baseless, as insulin is a life-saving drug and is essential for control of blood sugar esp. when oral drugs fail. Always remember that "INSULIN IS A NEED AND NOT A HABIT"
Insulin Pump is a medical device used for the administration of insulin in patients with diabetes, also known as Continuous Subcutaneous Insulin Infusion (CSII) therapy. The device includes: 1. Pump (including Controls, Processing module, and Batteries) 2. Disposable Reservoir for insulin (inside the pump) 3. Disposable infusion set, including a cannula for subcutaneous insertion (under the skin) 4. a tubing system to interface the insulin reservoir to the cannula. 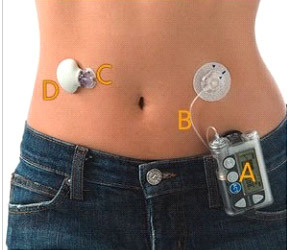 An insulin pump is an alternative to Multiple Subcutaneous Insulin injections (MSI) of insulin and allows for intensive insulin therapy when used in conjunction with blood glucose monitoring and "Carb Counting"